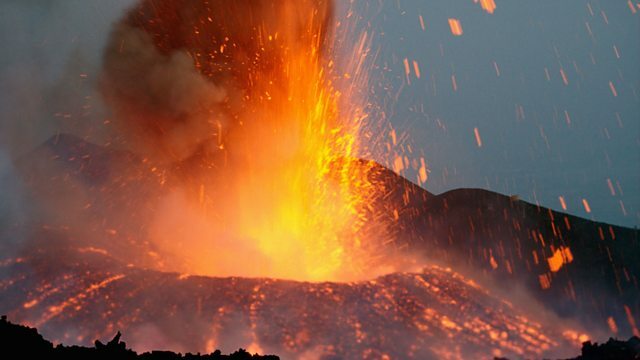 Melvyn Bragg discusses the formation and eruption of volcanoes, from the destruction of Pompeii to the risk of a Tsunami. Melvyn Bragg and guests discuss the formation of volcanoes. In 79AD Mount Vesuvius erupted on the Bay of Naples, buried Pompeii in ash and drowned nearby Herculaneum in lava. The great letter writer Pliny the Younger was staying with his uncle in Misenum and was a witness to the cataclysm. He described it to the historian Tacitus, It seemed as though the sea was being sucked backwards, as if it were being pushed back by the shaking of the land. Certainly the shoreline moved outwards, and many sea creatures were left on dry sand. Behind us were frightening dark clouds, rent by lightning twisted and hurled, opening to reveal huge figures of flame. These were like lightning but bigger. This eruption, which claimed the life of Pliny's uncle, is one of about 500 volcanoes to have erupted in the last two thousand years, some of which are now categorised by vulcanologists as Plinian, after Pliny's famous description.What causes volcanoes? What role do they play in the formation and maintenance of our planet? And is it ever possible to predict when and where they are about to erupt?With Hilary Downes, Professor of Geochemistry at Birkbeck, University of London; Steve Self, Professor of Vulcanology at the Open University; Bill McGuire, Benfield Professor of Geophysical Hazards at University College London.